10 oz seasoned meat patty, served with bacon, lettuce, tomato, and melted Swiss cheese. With side order of French Fries and Ketchup (3 Pouches-7g) on the side. 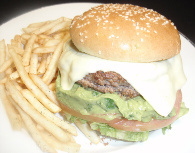 6 oz seasoned meat patty, served with lettuce, tomato, onions and melted American cheese. With side order of French Fries and Ketchup (3 Pouches-7g) on the side. 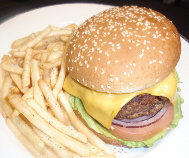 6 oz seasoned meat patty, served with lettuce, tomato, onions. With side order of French Fries and Ketchup (3 Pouches-7g) on the side.